Android Marshmallow ROM, Lineage OS 13 for Desire 820g Plus has now arrived via an UNOFFICIAL and OFFICIAL build. If you want some more Lineage OS ROM builds then stay tuned to the Lineage OS 13 ROM page and Lineage OS 14.1 ROM or the latest LineageOS 15 ROMs page. This LineageOS 13 based on Marshmallow for Desire 820g Plus is brought to you by saurav333. No donation link found for saurav333. THIS IS AN INITIAL BUILD WHICH MAY NOT BOOT AT ALL. HAVE A BACKUP BEFORE FLASHING THIS AND TRY AT YOUR OWN RISK. Installing a custom ROM on a Desire 820g Plus may require the bootloader to be unlocked, which may VOID your warranty and may delete all your data. Before proceeding further you may consider backup all data on the phone. You are the only person doing changes to your phone and I cannot be held responsible for the mistakes done by you. If there is no in-built ROOT or it does not work for some reason then you can try SuperSU ROOT to gain ROOT access. Download and keep the ROM zip file and the GApps file ready before start flashing. – Here is a guide explaining How to clear data using TWRP. Then Copy the GApps and Lineage OS 13 for Desire 820g Plus ROM ZIP to your phone. First flash the Desire 820g Plus Lineage OS 13 ROM ZIP from device. Then flash the GApps zip from your device memory. – Here is a post explaining flashing Marshmallow GApps. Reboot and Enjoy the Marshmallow Lineage OS 13 ROM for Desire 820g Plus. 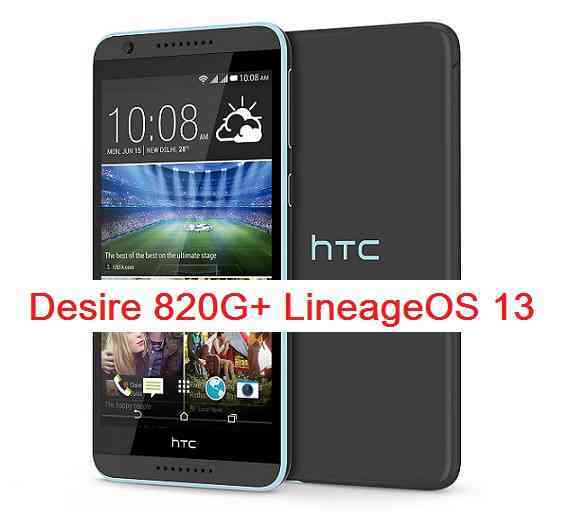 Copy the latest Lineage OS 13 for Desire 820g Plus ROM ZIP file to your phone. – Here is a post explaining Lineage OS installation precodeure. – Here is a post explaining Install GApps using recovery. How to ROOT Lineage OS 13. Stay tuned or Subscribe to the Desire 820g Plus forum For other Android Custom ROMs, Lineage OS 13 ROMs, other ROMs and all other device specific topics. I have flashed this rom (LineageOS 13 for Desire 820g Plus) several times and I keep on having “your device dosen’t have external storage. The app can’t start” error messages when I ran the camera some applications. The file manager does not have access to the internal and sd storage. Please what can I do to fix this problem? I installed . i have same problem too, aftter that my devise doesn’t read my internal storage . whyyyyyy ? What is the error are you getting?? Are you trying to access the internal storage through some file manager application or how?? It might not be mounted. May be you have to mount it manually I think. Hi man, thank you. non of file manager applications have not access the internal storage, also the file manager of the rom did not show anything . i installed Root Explorer APK too but there is nothing (no internal storage). i inserted SD card but no access too. No, did not mount, just installed the rom. Did anyone fix it ????? ?